"We provide a transformational education that enables our students to live happy and fulfilling personal and professional lives." We intend for Ark Evelyn Grace academy to be the school of choice in the local community, whose reputation is centred on great teaching, exemplary behaviour and unrivalled opportunities beyond the classroom. Our commitment is that we will work tirelessly in teaching, guiding and supporting all our students, so that they may go on to secure a place at a good university and ultimately compete for the very best positions in their chosen career. We believe that success and the ability to take control of one's destiny has to be achieved through self-control and th responsibilty and ownership of one's own future. There is no substitute for hard work and only the drive and presistence to get better and learn from mistakes and difficultiies will allow our students to achieve thier aspirational goals. We strieve for excellence in all that we do and so we help our students to realise that there should be no limit placed on thier ambition and capacity to achieve. These values permeate every aspect of our academy. They are modelled by our staff and celebrated in our students. They inform our assemblies and tutor times and give a language to talk about the sort of people we want all our students to become. Excellence is only achievable through self-discipline and endeavour, and these things combined enable each student to SEE the light illuminating their futures. At Evelyn Grace Academy, we believe that there is no substitute for hard work and this, above all else, will help our students understand and achieve excellence. Both teachers and students at Evelyn Grace never believe they have ‘arrived’ and are always seeking to improve and advance. As a member of our community of learners, our students are given regular and precise feedback so that they can develop and progress. We will help each student gain a firm knowledge and understanding so that the passion for their subjects grows and matches that of their teachers. We are also driven to stretch and challenge all our students to become better people so that they can make a positive contribution to the academy and wider community. We want our students to leave this academy, having become both cleverer and kinder people. 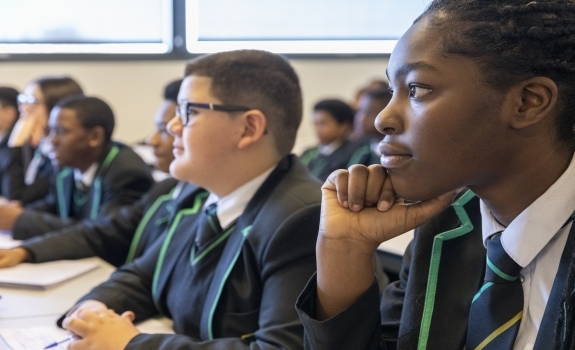 To achieve this, we give them a consistent diet of great teaching, along with a broad range of opportunities for leadership, responsibility and personal development both in and out of the classroom. We believe Ark Evelyn Grace is not just a place of learning; it is an intellectual journey of self-discovery and advancement. The journey towards that future starts here.